The oracles of Paul the octopus seem to be far, far more spicier than the games itself! 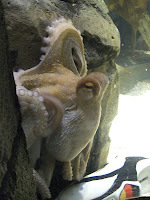 While some Germans fans are throbbing with anger directed at Paul the octopus, threatening to chop it up and cook it to meet the fate of any other octopus, I wonder if there really is anything psychic about Paul, or is it that chance has been on Paul's side far, in the so called "oracles". It is worth investigating whether the hype surrounding Paul's oracles demoralised the German team, leading to its debacle in the World Cup. That should be an interesting assignment for any psychologist. Now, it appears, Paul's oracles have competition. Mani, the parakeet, from Singapore's Little India, will have its moment of fame tomorrow, when his predictions are put to a test. But like any foodie, I would rather not worry about Paul's oracles. I would rather think about whether Paul would make for a delectable meal or not!!! !